CB Sugar to SharePoint File Stubbing SugarCRM, Inc. Minimize your Sugar storage space by automatically moving all your selected files from your Sugar to your SharePoint document library. CB Sugar to SharePoint File Stubbing is an event-based service offering flexible options for file stubbing and folder structure on SharePoint. It's a full customizable, cloud-based service running on our Azure-built SaaS platform. You can simply select which folders and files to stub and how often the service checks for new files. The physical file is moved to and stored on SharePoint, but a link remains in Sugar for quick retrieval if needed. So, Why stub files? To keep your Sugar lean and optimized, to save money on data storage, and to enable team collaboration with real-time customer data in SharePoint. Try it for free for 30 days! Using the Connecting Software SaaS Portal you can easily set up, manage and monitor your configuration. Everything runs via Cloud Service, which automatically performs the stubbing process and regularly checks for new files. You can modify all your settings at any time, depending on your needs. 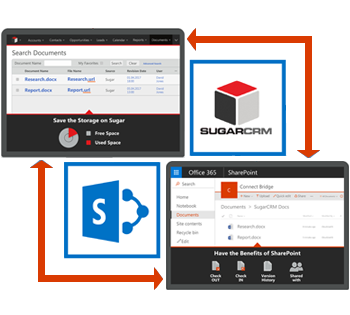 Use Sugar more efficiently and maximize your capabilities by enjoying all the benefits of SharePoint document management. Now your team can collaborate on SharePoint with real-time customer data without accessing Sugar. You set the stubbing interval that works best for you and keep full control over important information utilizing the SharePoint environment specialized for Document Management. Now you can check out/in, see revisions and share your work on both Sugar and SharePoint. Essentially, it's the best of both worlds combined with one reliable, fully secure, cloud service. The service offers flexible options for file stubbing and folder structure in SharePoint. It enables you to set up custom paths in the SharePoint document library and choose whether to store notes and documents to the same or to different locations on SharePoint. It can also group files by entity type, which means it will stub files attached to notes to a Notes folder, while files attached to documents will be stored in a Documents folder on SharePoint. You can also enable automatic folder structure creation for accounts, contacts, and other entities related to the notes or documents. Move your Sugar files to SharePoint to decrease storage costs and streamline your business processes. You'll still have a link in Sugar in case you need a specific document, but you won't being using your limited Sugar data storage. This way you streamline what customer files and documents are stored where, empowering team collaboration by having all files readily available in SharePoint. This means less Sugar seats needed for employees because they can securely access customer data in SharePoint instead of needing access to Sugar.